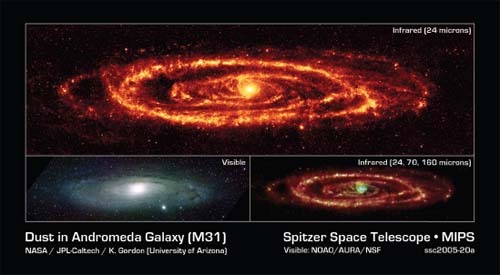 How similar is the Andromeda galaxy to our own? The Andromeda galaxy shares many characteristics with the Milky Way. It is a large spiral galaxy, like the Milky Way; it appears to be roughly the same age as the Milky Way; and it contains many of the same types of objects as the Milky Way, including a supermassive black hole at its center. Andromeda is somewhat larger than the Milky Way, but it is still close to 100,000 light-years (or about 600,000 trillion miles, or one million trillion kilometers) across.